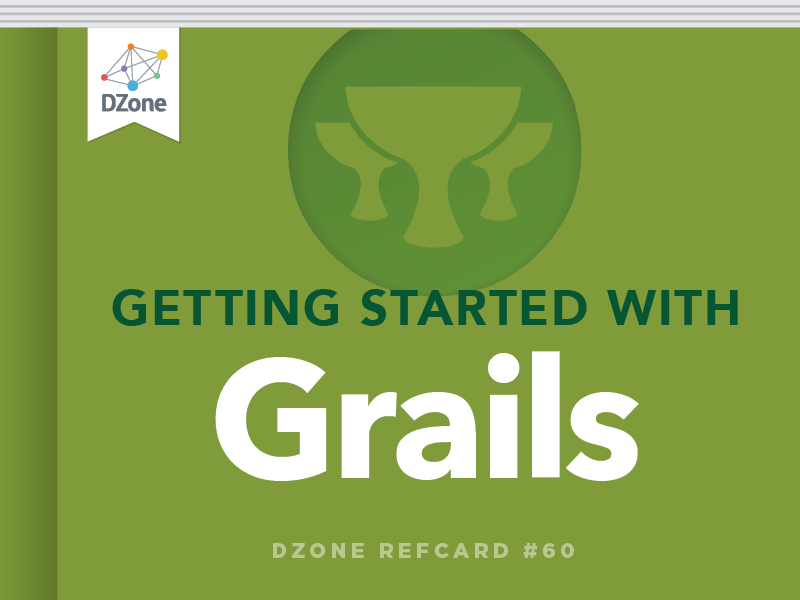 Takes you through a brief introduction of Grails, and helps you to set up your first Grails application in minutes. Grails is a full-stack web application framework built on top of such tried and true open source frameworks as Spring, Hibernate, Ant, JUnit and more. By applying principles such as Convention over Configuration and Don't Repeat Yourself, and taking advantage of the dynamic Groovy programming language, Grails makes it incredibly easy to use these powerful tools. Grails doesn't reinvent the wheel; Grails makes a wheel that inflates itself and rolls where you want it to! In case you are new to Grails, we'll start with a brief introduction, which should be enough to get you hooked and turn you into a Grails developer. That's when this Refcard will come in handy; it is a cheat sheet for Grails developers, a quick source for those things you keep having to go back to the docs to look up. Controllers, Services and Views with a detailed GSP taglib reference. Download the Grails archive from http://grails.org/download and extract it to a local directory. Set a GRAILS_HOME environment variable to that directory and add GRAILS_ HOME/bin to your path. (You also need a valid JAVA_HOME environment variable.) Now you're ready to go! Create-app and create-domain-class are Grails scripts. To see what other scripts are provided by Grails, run grails help from the command line. Navigate to http:// localhost:8080/AutoMart and look around. Figure 1 and Figure 2 show a couple of the views Grails gives us 'out of the box.' You can also leave it running while you continue to develop. Just save your changes and refresh your browser. This rapid feedback is one of the strengths of Grails. In our example the Car.groovy file that Grails created for us was placed in a directory called grails-app/domain. This is one of the many conventions in Grails. Placing source files in certain directories and naming them in certain ways can make magical things happen in a Grails application. Placing a Groovy class file in the grails-app/domain directory will turn it into a persistent domain class. Several properties and methods will be added to the class dynamically, and Grails will create a table based on the name of the class, with fields for each property. Grails controllers are simple Groovy classes with names ending in 'Controller' and residing in the grails-app/controllers directory. Controllers also receive several methods and properties dynamically. Any closure defined as a property in a Controller will become an action reachable by a URL in the following form: application/controller/action. For each controller in your application there will be a directory under grails-app/views/ named after the controller class (ie. grails-app/views/car). This directory is where your views (.gsp files) go. When a controller action is completed it will automatically attempt to render a view with the name of the action. So, when you call http://localhost:8080/AutoMart/car/list the list action will execute and render the list.gsp page. You can, of course render specific pages but convention can be a huge time-saver. A Groovy class with a name ending in 'Service' and residing in the grails-app/services directory becomes a Grails service and has built-in transaction handling and more. Creating custom tags in Grails is so easy it should be illegal. Just create a Groovy class ending with 'TagLib' and place it in the grails-app/TagLib directory. Then define a closure property and write to the OutputStream called 'out' that is already given to you. You can also use the tag's attributes and body by simply declaring them. There are no extra classes to create, no interfaces to implement, no TLDs to create. You could probably take up a new hobby with the time you'll save! Grails encourages unit testing by automatically creating stubbed out unit tests when creating artifacts (domain classes, controllers, services, and taglibs), and by including a powerful testing framework based on JUnit. In Grails 1.1 (and earlier via a plugin), there are several classes inheriting from JUnit's TestCase class. Figure 1 shows these classes. Here are some of the methods that are available to us in the Grails testing framework. mockDomain(class, list)- Mocks the domain class and stores instances in the list. Provides the dynamic GORM methods to class. mockFor(class, loose) '" Returns a mock of the class. loose determines whether mock has loose expectations or strict. mockForConstraintsTest(class, list) '" Similar to mockDomain but works for domains or command objects and adds a validate method to test constraints. mockController(controllerClass) '" Mocks a controller, adding the usual dynamic properties and methods. mockTagLib(tagLibClass) '" Mocks a TagLib, adding the usual dynamic properties and methods. mockLogging(class, enableDebug) '" Adds a mock logger to the class. The domain method list() takes four parameters which are used for sorting and pagination. These same parameters can be passed in a Map as the last parameter to the findAllBy* methods. Either the save() or validate() methods shown above will trigger Grails' powerful data validation. Grails provides 17 built-in constraints plus the validation constraint for custom validation. Many of these constraints also influence database schema generation; those are in shown in bold. GORM also makes relationships between different domain classes easier. Here we'll show how to implement the basic domain relationships. A bi-directional one-to-one is the same thing but with each class in the relationship having a reference to the other. Now a Car belongs to a Driver and when the Driver is saved the Car will be saved too. If the Driver is deleted then the Car goes with him. Makes sense. belongsTo also works with unidirectional relationships. To declare a uni-directional one-to-many relationship just include a static hasMany property in the owning class. Now a Driver will have a Collection of Car instances called cars. To make this bi-directional add a belongsTo property to the many class. A many-to-many relationship can be declared by adding a hasMany to both classes involved and a belongsTo property to one of them. There are three possible conclusions to a controller action in Grails. You can return map of data or nothing and Grails will attempt to display the .gsp view with the same name as the action. You can also redirect to another url or action. The third way is to render something. This can be a view, a template, JSON, XML or just about anything that can be written to the response. controller Controller to redirect to. If action is not present the default action of the controller will be used. action Action to redirect to. If controller is not present current controller will be used. id Id to be passed, as params.id, to the redirect. url URL to redirect to ('http://grails.org'). uri URI to redirect to ('/car/edit/1'). params A map of parameters to be passed to the redirect. template A template (partial GSP view). Often used with AJAX actions. model A map containing data to be used by the view or template. bean A single bean to used as the model for the view or template. collection A collection of objects to be used as the model for the view or template. builder Builder object to be used to render markup. contentType Sets the content type of the response. Grails service classes are powerful and easy to use. Here's a few important things to remember when using services. You can also inject Services into plain old groovy objects, but it takes a couple more lines of code. First declare the service in your POGO. This will tell Spring to inject any Spring beans that are declared in the MyPogo class into the myPogo instance. Since Grails service classes are Spring beans, the carService will be injected. Grails services are singletons by default. To change that you just need to declare a static scope variable. noSelection single-entry Map with a default key to return and a default value to display. valueMessage-Prefix Will be prepended to the option value with a '.' to create a key to lookup the value in the i18n message bundle. name Required; the title of the button. if 'action' is not specified, this will be the default action. createLink- Creates a URL which can be used in anchor tags, etc. url a Map containing the controller, action, id, etc. In Grails: A Quick-Start Guide,you'll see how to use Grails by iteratively building an unique,working application. By the time we're done, you'll have built and deployed a real,functioning website. mockFor(class, loose) '\" Returns a mock of the class. loose determines whether mock has loose expectations or strict. mockForConstraintsTest(class, list) '\" Similar to mockDomain but works for domains or command objects and adds a validate method to test constraints. mockController(controllerClass) '\" Mocks a controller, adding the usual dynamic properties and methods. mockTagLib(tagLibClass) '\" Mocks a TagLib, adding the usual dynamic properties and methods. mockLogging(class, enableDebug) '\" Adds a mock logger to the class.